What is 3DB6830 UWB IC? 3DB6830 is 3db's flagship highly integrated ultra low power IR-UWB transceiver with integrated security layer for secure distance bounding and data communication. 3DB6830 is a full Impulse Radio UWB-based transceiver in the upper UWB bands from 6 to 8 GHz. It is IEEE 802.15.4f compatible and meets ETSI and FCC Part 15.250 regulations. 3DB6830 also includes a formally proven purpose-built MAC layer for secure distance bounding and data communication especially designed for security applications. It has been designed to counter all logical-layer and physical-layer distance modification attacks and can be configured to ensure different degrees of security while providing su cient amount of distance measurements to be run in a single session. Any microcontroller being able to provide random number generation and authentication routines is suitable to drive 3db UWB IC. The core of 3db's innovative secure distance measurement technology is the use of Ultra-Wide Band (UWB) signaling in order to deliver ultra-low power and provably secure technology from the logical layer down to the physical layer. Central to 3db ultra-low power and secure technology is the use of short nanosecond long UWB pulses compliant to the IEEE 802.15.4f UWB standard. Such RF pulses allow maximizing the energy per pulse at the Transmitter which is crucial since it allows to reduce the complexity of the Receiver for a given distance range. Receiver power consumption reduces significantly owing to a decreased on-chip processing obtained by significantly less pulses to process for a given distance range. This automatically translates into less complexity and silicon size. 3db IC performs a true direct Time-of-flight (ToF) distance measurement using radio frequencies (RF). 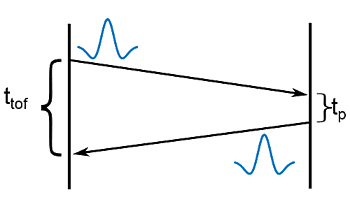 In RF-based ToF-based distance measurement, the distance d between two devices is given by d = (trx - ttx).c, where c is the speed of light, ttx and trx represent the time of transmission and reception respectively. The measured time-of-flight can either be one way time-of-flight or a round-trip time-of-flight. One way time-of-flight measurement requires the clocks of the measuring entities to be tightly synchronized. The round-trip time is the time elapsed between transmitting a ranging data packet and receiving a response. The advantage of round trip time is that it enables any two devices to measure the distance between them without any help of external infrastructure. Furthermore this allows ad-hoc network creation and self-localization. The figure above illustrates a round-trip ToF distance measurement between two devices also often referred to as 2-Way ranging. The distance at the measuring device is given by d = (ttof - tp).c/2 , where ttof is the measured round-trip time and tp is the processing delay at the measured device i.e.,the time taken by the measured device to process and transmit a response to the measuring device. The precise distance measurement largely depends on the ability to estimate the time-of-arrival and the physical characteristics of the radio frequency signal itself. Given that the ranging precision is directly proportional to the bandwidth of the RF signal, IR-UWB signaling with signal bandwidths larger than 500 MHz is the best approach to achieve highly accurate real-time RF-based distance measurement. 3db UWB IC achieves 10 cm accuracy on a single round-trip time-of -flight measurement using just 10 uJ. Using more measurements and filtering techniques allows achieving centimeter-precision accuracy. er and a prover. They are proven to be only viable solution again Relay attacks. er and the prover using logical and physical layer techniques and thus shorten the measured distance. From the very beginning 3db UWB IC was designed to counter the strongest attacker and prevent all logical and physical layer attacks aiming at decreasing and/or modifying the measured distance! 3db secure measurement concept has been independently evaluated by several universities and security consultancies. For engineering samples, datasheet, reference designs, consulting, please do not hesitate to write to us using our ﻿contact form﻿.